Small-craft warnings are of no help to some sailors. A case in point is the recent storm activity that transformed the ocean’s surface into a foamy frappe, blowing some hapless ships onto the beach at La Jolla Shores. The sailors weren’t asleep in the galley; they simply lost their luck. I’m referring to by-the-wind sailors (Velella velella), jelly-like animals belonging to the hydrozoans, which float on the surface of temperate and tropical waters worldwide. Their crafts rely on wind power for propulsion, a system that works well under prevailing winds. However, when quirky wind patterns blow, the wayfarers get pushed against their will to shore where they quickly dry to the consistency of cellophane. The sailor and sailing ship that is a Velella consists of familiar and unfamiliar boating parts that combine to create a compact craft. The oval deck is deep blue with concentric air-filled tubes; the hull (belowdecks) carries the craft’s mechanical parts like mouth, digestive system, reproductive structures and short, fringing, stinging tentacles. Anchored atop the deck is a somewhat stiff, clear, triangular sail, which is permanently set on a diagonal tack of 45 degrees. The sail’s tilt is set from birth and may be northwest to southeast or northeast to southwest. Scientists believe a mix of both right- and left-handed sailors are born in the central Pacific, then prevailing winds sort the mirror-imaged groups onto opposite sides of the ocean. It’s a good hedge against losing entire populations from blowing ashore, at least not by moderate winds. Winds in the northern hemisphere cycle clockwise, so the sails are typically right-handed. However, if prolonged southerlies or westerlies blow, the sailors may be driven thousands of miles to beach on our coast. Velella aren’t solo sojourners. They not only travel in flotillas of hundreds to millions, they also carry paying passengers. The symbiotic green algae on board earn their keep by stoking the ship’s larder. It’s a good partnership because the algae receive a secure, light-abundant place to photosynthesize (make food for by fixing carbon dioxide in the air to produce simple sugars). 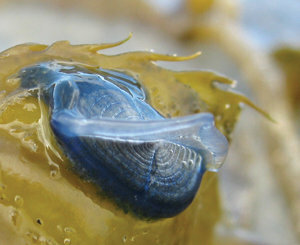 Excess carbohydrates that leach out of the algal cells are taken up by Velella tissues and metabolized. But sailors cannot live on carbs alone, so with the wind across their sails, they roam the open ocean for zooplankton like fish and shrimp eggs, which they capture with their stinging tentacles. 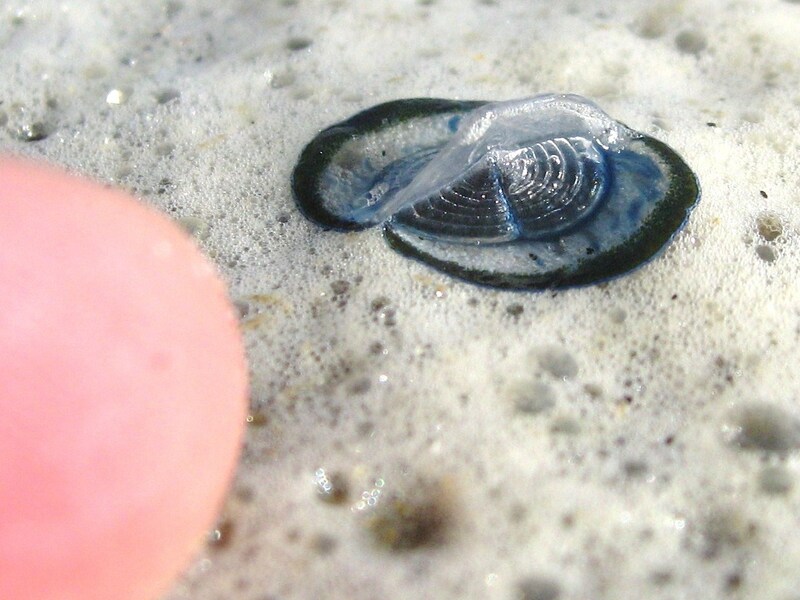 When it comes to reproducing, Velella live sort of a double life, having two distinct stages that alternate generations. The polyp stage belongs to the free-floating sailors, easily seen with the naked eye. This generation is nonmotile and asexual. It’s typical for the polyp stage to settle onto the sea floor and remain anchored for the course of its life. Velella curiously evolved as an upside-down polyp, settling instead on the water’s surface and growing a float instead of a root system. Being asexual, reproduction is a cinch for polyps, which bud off tiny bodies, both male and female, produced below the polyp float. These bodies represent the medusa stage: the sexual, motile generation of Velella. They resemble jellyfish but being pinhead-sized, you’d need a microscope to see them. Medusae are sexually mature at the get-go. They immediately release eggs or sperm into the water, where mating pairs connect to produce embryos. These develop into free-swimming larvae, which in turn grow to become sailing polyps. These polyps will then produce medusae to continue the alternation of generations. It has been several years since I’ve encountered by-the-wind sailors marooned onto a local beach, so who can say when another flotilla will reluctantly arrive. Aside from untoward winds forcing their demise, Velella may be victims of predators like floating sea snails and some fish. However, the most imminent danger Velella face is floating contamination like motor oils, crude oil from tankers, solvents, pesticides and herbicides. As for the Velella flotillas presently wandering the high seas, I hope they continue to enjoy smooth sailing over clean waters.